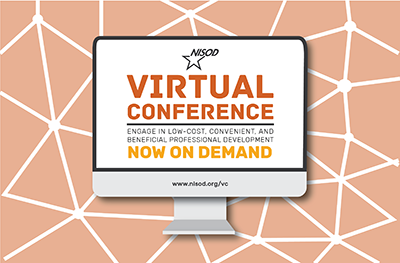 NISOD’s Annual Virtual Conference, which brings the reputation of our annual conference to a virtual platform, is a huge success! Due to popular demand, we are making recorded Virtual Conference sessions available for purchase at a nominal fee. Individuals who registered for our Virtual Conferences can request instructions for accessing the recorded sessions. Purchase 2018 Digital Access Now! “Students don’t care how much you know until they know how much you care.” Discover secrets for tapping into your students’ motivation in the classroom. Learn how to use The Five Languages of Appreciation in the Workplace in a classroom setting. Session participants leave with concrete strategies and techniques that use the languages of appreciation and motivational theory in and out of the classroom to enhance student engagement and success. Do you want to get students more engaged in your lectures? Following a quick review of Multiple Intelligence Theory, participants explore collaborative-learning exercises that increase your classroom’s energy level. Be more student-centered in your approach to teaching. Attend this session to learn easy-to-execute college teaching techniques! This session helps identify triggers and healthy de-escalation models that can be used in the classroom. Discussed are students’ psychological well-being and how to effectively deal with crisis in the classroom. Participants gain knowledge that can be used to provide support and aid in removing the stigma of mental illness in the classroom. Traditional methods of teaching are mainly centered on the foundational underpinnings of pedagogical theory. Socratic teaching is the most powerful teaching tactic for fostering critical thinking when teaching adults; student engagement is paramount in andragogy. The focus of this session is on simple progressive methods used to teach adult students how to think instead of what to think, which increases students’ ability to apply subject matter and enhances their overall learning experience. Have you ever sat through an endless faculty meeting that seemed to have no real purpose? Don’t put your students through the same suffering! Engaging students in the learning process increases their focus, improves their critical-thinking skills, and helps them become invested in their learning. They (and you) will also have a lot more fun. Join this session to build your arsenal of engaging teaching strategies. Purchase 2017 Digital Access Now! Communication between college faculty is a key component in modifying curriculum and maintaining a positive learning culture. Appreciative Inquiry (AI) is a problem-solving method based on organizational analysis. This session introduces participants to AI’s four phases: Discover, Dream, Design, and Destiny. Engage in a problem-solving session using the 4D method to enhance your understanding of the process. Wake Tech Community College developed a mandatory certification program for all online faculty to increase faculty preparedness. A team of faculty and e-learning support staff developed e-learning standards and a rubric used to evaluate online courses. The presenters provide details about the EPIC Online Teaching Certification, which offers 30 hours of professional development that cover every aspect of online instruction. Research on faculty type with regard to impact on student success is ambiguous. However, two things are clear: we rely on adjunct faculty to teach a large number of courses and adjunct faculty do not have equal access to the resources that support teaching excellence. Identify low-cost ways to boost teacher effectiveness and formulate versions of these ideas for their own campuses. Experience the three-year journey through the Instructor Preparation Academy from the perspectives of new, fulltime faculty at Northeast Wisconsin Technical College. Examine how Boot Camp, Faculty Learning Communities, and Individualized Professional Development plans support and engage faculty in their professional development and career growth. Often decisions affecting adjunct faculty occur without their input. Alternatively, administrators and tenured faculty may not be fully aware of the issues adjuncts face. This session introduces main issues from the perspective of adjunct faculty. Adjuncts, full-time faculty members, and administrators have the opportunity to discuss these important issues directly, increase interaction with each other, and seek mutual understandings. This session provides an overview of various strategies and online resources that help faculty members stay current in their respective teaching disciplines. Social media tools, as well as additional assets, are explored. Participants gain an understanding of what a Personal Learning Network (PLN) is and why it can be beneficial to their teaching and learning. A variety of technologies are identified to help build, modify, and interact with a PLN. Engaging adjunct faculty with course assessment processes involves many challenges, including scheduling, compensation, and lack of commitment. A faculty retreat that features assessment can deal effectively with these challenges. Discuss general strategies for scheduling, securing compensation, sparking faculty interest, managing a group assessment activity, facilitating assessment rubric revisions, and using the revised assessment rubric. This session showcases a simple model for including the adjunct voice. The protocol, GLUE, structures a professional learning community for adjuncts and outlines an efficient process where full- and part-time faculty, administrators, and support personnel share visions and ideas on behalf of students. Learn about effective questioning techniques that foster “critical friendship” and how to move from a culture of “drive-by” interactions to a culture of meaningful teamwork! The Virtual Conference supplements NISOD’s offerings of professional development programs and resources, which culminate with NISOD’s Annual International Conference on Teaching and Leadership Excellence held every Memorial Day weekend in Austin, Texas. NISOD’s annual conference is noted as the premier convening of community and technical college faculty, administrators, and staff who strive for excellence in leadership, teaching, and learning. For more information about NISOD’s annual conference or to register, visit www.nisod.org/conference.